Matt 15:24 But he answered and said, I am not sent but unto the lost sheep of the house of Israel. Even Jesus recognized he was not sent to everyone but only to the LOST SHEEP OF ISRAEL.Peter was sent to the Jews, but Paul to the Gentiles. Until You understand this fact, you will want everyone to listen and follow your ministry. No pastor/ministry was sent to everyone on earth. RELAX AND LEAD THOSE YOU WERE SENT TO. As God begins to lift and expand your work, different people will be attracted with different purposes. Some can even claim God appeared to them to work or submit to you as sons and daughters or branch pastors. Please be very prayerful, sharp and careful because people come for different reasons but no matter the reason, know that it is because of what you carry that they came. So create scarcity for them because by experience I understand people don't value what is always available and accessible. Don't be bigger than your fathers, mothers, mentors and seniors in ministry no matter your level. 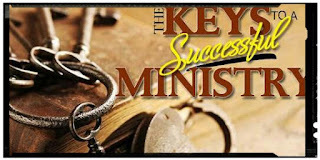 Crowd, popularity, possessions, affluence and influence doesn't make you a father, mother, mentor or senior in ministry. Fathers, mothers and mentors are made and appointed by GOD. GOD BLESS YOUR MINISTRY. STAY BLESS !